How much is a slip and fall claim worth? If you sustained injuries due to a slip and a fall while on someone’s property, you may need to launch a claim for compensation against the property owner. Among top factors that will motivate you to pursue compensation is the amount you will receive from the claim. 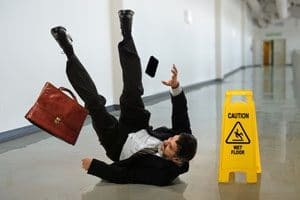 The worth of your slip and fall claim varies depending on different factors as recorded on the immediate cause and conditions arising due to the injuries sustained. Each case is different due to the fact that there is no standard venue. However, there are several considerations that are common in many cases that you can use to gauge the worth of your slip and fall claim. Bills for past and future treatment linked to your fall will be included among measuring sticks that will determine what you will receive as compensation at the end. Based on your place of residence, the sum used for the calculation of damages could be the amount billed by the healthcare provider, or what the healthcare provider offered to accept for the whole procedure. If the slip and fall claim is valid, its worth should not be less than the total value of your hospital bills. Pain and suffering could be one of the least predictable components of the claim while deciding its value. There are no standard rules for determining the extent of pain or suffering and its relative costs; however, your medical bills are held as a base while gauging the situation in this case. Considering the severity and permanency of the injuries sustained, the attorney and insurer may settle for a unanimous multiplier, which is appropriate for both parties to be used with the value of your medical bills. Also remember that some injuries do not show up immediately, so you should negotiate the claim with the future in mind. If you were not able to go to work or engage in any money generating activity, you are entitled to compensation for the loss of wages and earnings. The amount you earn will be verified with respect to the total time lost, and this should come attached with a pay or tax return stub. Verification from your employer is needed to state the time you could not go to work due to the injury as well as your wage rate. In some cases, the injuries are so severe to an extent that you are not able to go back to the work you used to do, or if you do you will not be in the right position to earn as much as you used to before the injuries. This is loss of your earning capacity because many of the things you were able to do become impossible. Therefore, it’s only fair to state that this scenario should feature as part of your claim. You may also incur additional charges while securing treatment for the injuries. For instance, you may spend more than £100 to fuel your car so you can travel for doctor’s appointments. To receive compensation for such expenses, you are supposed to prove a valid link between the expenses and the injuries. This entry was posted in Work Accidents on 5th April 2016 by pinnacleadmin.